Two men enter! One man leaves! At next months 3XWrestling show, “Divide and Conquer”, a 60 minute Iron Man No Disqualification match will take place at the Des Moines Social Club! Mark Sterling will take on former 3XW Heavyweight champion “The Rebel” Jeremy Wyatt in a match that will be a ferocious battle with one man finally laying claim to being the best in the Midwest. Mark Sterling debuted in 3XW in 2006 at “Retribution” at the legendary One Dollar Fitness Center (aka Devin Carters’ home). He had already built a solid reputation around the Midwest as he has been the NWA Central States champion, NWA Kansas champ and a NWA Midwest Tag Team champion. 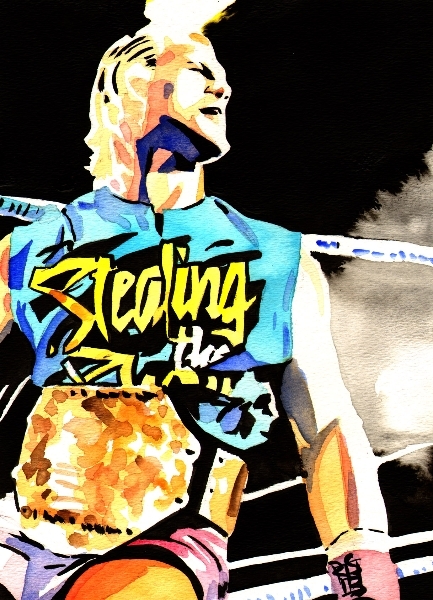 During that first year Sterling, who had much shorter hair at the time, established himself as great technical wrestler that could hold his own against anyone. In late 2007 a change started to take place within Mark Sterling. He grew his hair out longer and added facial hair along with a lot more muscle. He began to get more intense during his matches and started talking more on the mic. 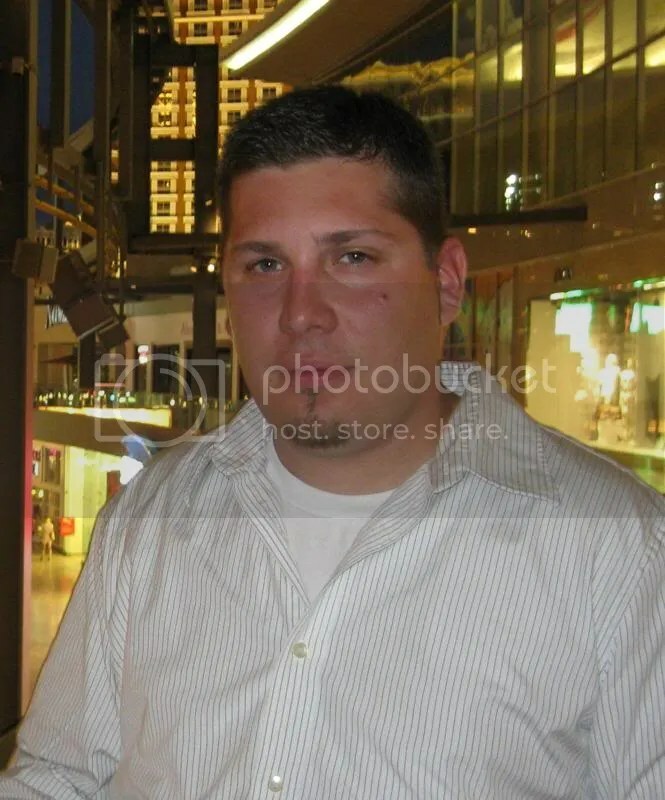 He joined forces with Gage Octane and “Commissioner” Todd Countryman to form the original “Gentlemen’s Club”. In 2008 Sterling would win the 3XW Pure championship from Maddog McDowell of course with the help of the sneaky “Commissioner”. With Sterling now having backup at his beckoning call his new attitude became even more intensive then before! He came out to the ring like a mad man calling out wrestlers and yelling at fans and scaring small children. He would even taunt the 3XW crowd by daring anyone to do more push ups then he could and of course nobody could. In the ring Sterling was now even more dangerous and would cheat at all times in an effort to get the win. He was all business when he got in the ring and his opponents knew it as Sterling would anxiously wait to get his hands on whoever crossed him. Sterling and Octane would take the Tag Team titles and hold on to them for eleven months before finally losing them to “The High Flyers”. After this loss Sterling and Octane went after “The Horndogs” before getting a rematch for the belts but during this time Sterling began to show a new face. As passionate as Sterling is about winning he now started showing respect for those he fought in competition. After losing a hard fought match with “The High Flyers”, one in which Sterling stopped “The Gentlemen’s Club” from interfering; Octane, Countryman and Casanova attacked the “Flyers” from behind. An already enraged Sterling assaulted his former teammates but was out numbered and left unconscious in the ring. Mark Sterling came back not long after for revenge on his one time stable mates and seemed content on finishing them off for good. But unfortunately a man known as “The Rebel” Jeremy Wyatt had other plans. These two superstars meet during the final for the “King of Des Moines 2010 Tournament” in what turned out to be a classic match up and saw the crowing of King Sterling. This feud started way before they met at 3XW though as these two Kansas natives have fought over 100 times in other promotions around the country. At “Clobberpalooza Classic III” they had the rematch from the previous month’s tournament and saw Wyatt get the pin. Sterling challenged Wyatt again to a two out three falls bout at “Halloween Horror 4” and this time Wyatt used the assistance of a steel chair to knock out Sterling and get the win. Then at “November Knockout 2” Sterling and Wyatt hand picked each others opponents. They each won their match and at the end of Sterlings’ match a masked man appeared on the entrance but to everyone’s surprise Wyatt came from behind to attack him. The other wrestlers tried to keep them apart but to no avail as these men wanted blood! Sterling grabbed the microphone and challenged Wyatt once and for all to a one hour Iron Man match. Wyatt agreed but only if it is No Disqualification! Mark Sterling has trained a lifetime for this match and Wyatt will come prepared to fight to the death. There’s only one way to see the bad blood between these two come to an end and that is to come out to “Divide and Conquer” and see which man remains standing! “Divide and Conquer” will be held at the Des Moines Social Club on Friday, January 7th located at 1408 Locust Street in Des Moines, IA. 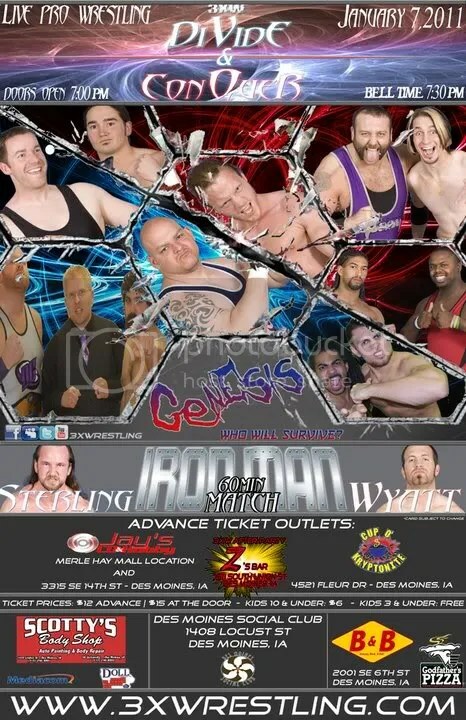 Tickets can be purchased online at 3XWrestling.com or at Cup O’Kryptonite and both Jay’s CD and Hobby locations. Advance presale tickets cost $12 for adults and $6 for kids 10 and under. Ticket will also be sold the night of the show at $15 for adults, $6 for kids 10 and under and kids 3 and under are free. Doors open at 7:00 p.m. with the bell time being 7:30 p.m. Sterling will destroy all! 3XWrestlings “Halloween Horror 4” is just over a week away and more matches have been announced to this already spook-tacular line up. There will be scares, screams and terrors at the Des Moines Social Club on October 1St for a frightful Friday night of pro wrestling action! There will also be a tag team match with American Ground and Pound, featuring Nate Bash and Ben Sailer, going against the team of Sir Bradley Charles and “The American Fury” Jon West. This match could decide which of these teams should face the winner of the Tag Team title match that will also take place that night. With American Ground and Pound ranked at number two in the tag team division and Charles and West at number three these teams will give everything they got to get a title shot. Plenty of more matches are already set for “Halloween Horror 4” including championship title bouts, grudge matches and the bone breaking, head crunching over the top battle royal! The video featured this week takes a look at last year’s battle royal at “Halloween Horror 3” and is also 3XW’s match of the month. In addition to the pro wrestling there will also be a costume contest with prizes being given away to the top costumes during the intermission. Come out as your favorite or least favorite 3XW wrestler if you’re not afraid! 3XWrestling’s “Halloween Horror 4” will be held at the Des Moines Social Club on October 1st located at 1408 Locust Street in Des Moines, IA. Tickets can be purchased online at 3XWrestling.com or at Cup O’Kryptonite and both Jay’s CD and Hobby locations. Advance presale tickets cost $12 for adults and $6 for kids 10 and under. Ticket will also be sold the night of the show at $15 for adults, $6 for kids 10 and under and kids 3 and under are free. Doors open at 7:00 p.m. with the bell time being 7:30 p.m. Please no Casanova impersonations. As the days get colder and nights get shorter out come the ghouls and goblins and that can only mean one thing, 3XWrestling’s “Halloween Horror 4” is almost here! On October 1st at the Des Moines Social Club come see the best the Midwest has to offer for a horrific night of professional wrestling! 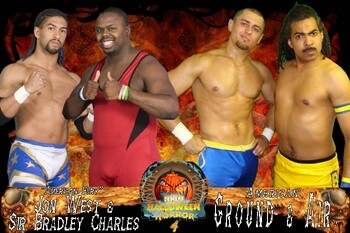 Without a doubt one of the most anticipated match ups for “Halloween Horror 4” will be the bout for the tag team gold. The current Tag Team champs, The Gentlemen’s Club, are set to defend their titles against The Horn Dogs. These two long time tag teams will be looking to do some damage at the 3XW arena and no one will want to get in their way! The 3XWrestling Tag Team champs consist of the handsome Casanova and the red headed wonder boy, “Delicious” Devin Carter. These two have been with 3XW from the beginning and are the first ever tag champs for this promotion. But they have not always been friends and have looked at other from the other side of the ring as they fought over the 3XW Heavyweight title. After some grueling battles against each other Carter decided to do the unthinkable and team back up with Casanova in February of this year thus joining the much hated Gentlemen’s Club. Their second reign as the Tag Team champions came with a win over the High Flyers in March and they have been terrorizing 3XW and the fans ever since. See the Gentlemen's Club at 3XWrestling's "Halloween Horror 4"
The Tag Team champs are going to need to bring everything they got plus the kitchen sink if they are even thinking about beating the top tag team contenders, The Horn Dogs. This unlikely dynamic duo is made up of the huge and powerful Maddog McDowell and the agile cruiserweight Krotch. The Horn Dogs had first teamed up in 2008 but went their respected ways as McDowell took on all challengers as he held the 3XWrestling Heavyweight title. Renewing their interest in the tag team gold this year The Horn Dogs have reunited in hopes of taking the belts back to the “dog house”. McDowell and Krotch have both stepped up their wrestling game and winning the gold could send them to the next level. Maddog McDowell in action at 3XWrestling's "Clobberpalooza Classic III"
All eyes will be on the ring for what should be a classic match featuring brute strength, fast paced action and maybe a sleeper hold or two. Also be on the look out for the Gentlemen’s Club manager, the despicable and conniving “Commissioner” Todd Countryman, who will most likely be waiting for the opportunity to use his loaded briefcase. Other championship bouts and grudge matches will be taking place in addition to a frightfully scary over the top rope battle royal! Come join the family friendly action that is pro wrestling with 3XW. 3XWrestlings’“Halloween Horror 4” will be held at the Des Moines Social Club on October 1st located at 1408 Locust Street in Des Moines, IA. Resevse your tickets exclusively at the 3XWrestling website or tickets can be purchased at Cup O’Kryptonite and both Jay’s CD and Hobby locations. Advance presale tickets cost $12 for adults and $6 for kids 10 and under. Ticket will also be sold the night of the show at $15 for adults, $6 for kids 10 and under and kids 3 and under are free. Doors open at 7:00 p.m. with the bell time being 7:30 p.m. Please do not throw chairs! We are happy to announce that we now have a new member to the MWR family as Iowa native Mark Campos will bring to the site his great talents for all you fans to enjoy. I was recently referred to him from a close friend who recommended that I checked out the great work Mark had done for the Pro Wrestling examiner.com in Des Moines. So everybody please keep an eye out for Mark as he debuted tonight with Sterling vs Wyatt will blow the roof off of 3Xwrestling. With out further ado I give you Mark Campos. 3XWrestling’s annual “Halloween Horror 4” is just under three weeks away and the anticipation for the event keeps building. This frightful night is certain to include mangled bodies, bone crushing action and high flying thrills! A match that was made at last months “Clobberpalooza Classic III” in now set to make this next show a must see for any pro wrestling fan. “The Rebel” Jeremy Wyatt and Mark Sterling are set to battle in what will no doubt be a contender for match of the night. The hatred between these two runs deep and is very real as they have had over one hundred matches against each other all over the country. Mark Sterling is now hearing cheers as opposed to the jeers he had been receiving for years as a member of the arrogant “Gentlemen’s Club”. Now Sterling is considered to be a fan favorite and in many eyes should a top contender for the Heavyweight championship. Jeremy Wyatt truly stepped up his wrestling game in 3XW last year and has been on a physical and psychological warpath ever since. Wyatt debuted without much noise but with now with fire in his eyes he will do whatever is necessary to get the win. Taunting his challengers and fans alike this man needs security guards to even leave the arena. Their feud in 3XWrestling began in August in the finals for the “King of Des Moines 2010 Tournament”. Both Sterling and Wyatt had fought there way up through the bracket facing two different opponents each that night before clashing with each other for the crown. The match that night was a masterpiece as each wrestler applied submissions, reversals and punches in what was a thirty minute classic. In the end that night Sterling was able to roll up Wyatt to get the win and become king. Sterling offered his hand in respect to “The Rebel” but in true Wyatt fashion he blew him off and instead wanted a rematch at the next show. Sterling gladly accepted the invitation. After the match at “Clobberpalooza Classic III”, which saw Wyatt pin Sterling with a small package, “The Rebel” now claims to have won fifty-one matches to Sterlings’ forty-nine wins. Thus making Wyatt the superior wrestler or at least in his mind and maybe some of the 3XW fans. “The Rebel” then acted like he wanted to shake Sterlings’ hand but pulled away at the last second chuckling as he left the ring. Sterling grabbed the microphone and challenged Jeremy to a two out three falls to determine the better wrestler once and for all! You will not want to miss out on this match as these exceptional Midwest stars light up the Des Moines Social Club. Some great matches have been signed for “Halloween Horror 4” including a battle royal, championship matches and grudge matches. Others matches will come in the following weeks leading up to this amazing event. 3XWrestlings’“Halloween Horror 4” will be held at the Des Moines Social Club on October 1st located at 1408 Locust Street in Des Moines, IA. Tickets can be purchased at Cup O’Kryptonite and both Jay’s CD and Hobby locations. Advance presale tickets cost $12 for adults and $6 for kids 10 and under. Ticket will also be sold the night of the show at $15 for adults, $6 for kids 10 and under and kids 3 and under are free. Doors open at 7:00 p.m. with the bell time being 7:30 p.m. Don’t miss it! Check out the video below to see Mark Sterling in action from 2006 as he takes on Casanova.